Oral PRIMO is a brand name for the anabolic steroid Methenolone Acetate. This agent is very similar in action to PRIMObolan Depot (methenolone enanthate), except here the drug is designed for oral administration instead of injection. Methenolone acetate is a non-c17-alpha-alkylated oral steroid, one of only a few commercially available oral agents that presents limited liver toxicity to the user. It is also highly favored for its properties as a moderately effective anabolic with low androgenic and no estrogenic properties. It is, likewise, commonly used during cutting phases of training, when lean tissue growth and solid muscularity, not raw bulk, are the key objectives. Methenolone acetate is an excellent oral steroid drug. Unlike most other orals, it is not 17-alkylated and does not have liver toxicity problems. It is perhaps only half as potent by the oral route as by injection, so dosages need to be high, at least 100 and preferably 200-300 mg per day, but if that can be afforded it is an excellent drug. It is unusual among oral steroids as being Class I, binding well to the androgen receptor.The claim, however, that methenolone acetate tablets help burn fat, as a result of being acetate esters, is purely a myth. The compound has the same LBM-sparing properties when dieting as does injected PRIMO tabs, which is to say, it is quite useful if dosage is sufficient. 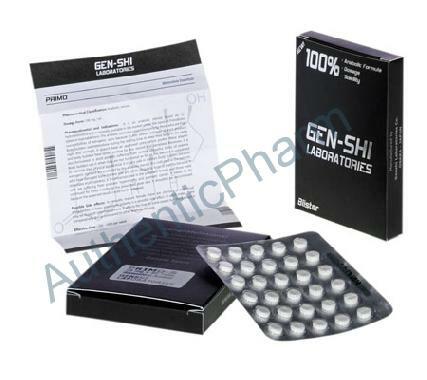 The usual Methenolone Acetate (Oral PRIMO) tablets administration protocols for physique- or performance-enhancing purposes call for 75 - 150mg daily, which is taken 6 to 8 weeks. This level is sufficient to impart a measurable anabolic effect, although one usually doesn't expect to achieve great gains in muscle mass with this drug. Instead, PRIMObolan is utilized when the athlete has a specific need for a mild anabolic agent, most notably in cutting phases of training. Due to its mild nature, PRIMObolan is often used in conjunction with other steroids for a stronger effect. In such cases, a slightly lower dose is often used (50 - 100mg per day). During a dieting or cutting phase, thought to be its primary application, a non-aromatizing androgen like trenbolone is often added. Such combinations would enhance the physique without water retention, and help bring out a a harder and more defined look of muscularity. Non-aromatizing androgen/anabolic stacks like this ware very popular among competing bodybuilders, and prove quite reliable for rapidly improving the contest form. This compound is also occasionally used with more potent androgens during bulking phases of training. The addition of testosterone, Dianabol or Anadrol is common, although the gains are ofter accompanied by some level of smoothness due to the added estrogenic component, as well as hepatotoxicity in the case of the latter 2 agents. Side Effects: Although classified as an anabolic steroid, androgenic side effects are still common with this substance. This may include bouts of oily skin, acne, and body/facial hair growth. Anabolic/androgenic steroids may also aggravate male pattern hair loss. Women are also warned of the potential virilizing effects of anabolic/androgenic steroids. These may include a deepening of the voice, menstrual irregularities, changes in skin texture, facial hair growth, and clitoral enlargement. Methenolone is still a very mild steroid, however, and strong androgenic side effects are typically related to higher doses. Women often find this preparation an acceptable choice, observing it to be a very comfortable and effective anabolic. Methenolone is not considered a hepatotoxic steroid; liver toxicity is unlikely.